A resource sharing service offered at all libraries within the University System of Georgia (USG). This service provides access to all eligible circulating books at USG libraries. GIL Express is available to all authorized users through remote requesting in the GIL-Find catalog as well as an on-site (walk-up) service. It is different from Interlibrary Loan (ILL). Interlibrary Loan (ILL) is a service offered by libraries through which they borrow and lend books and copies of articles with other libraries throughout the United States and around the world for eligible patrons to support the patrons’ specific educational and research needs. ILL is not the same as GIL Express. Try GIL Express for books before requesting through ILL.
Who can use the GIL Express Service? All currently enrolled students and currently employed faculty and staff of the University System of Georgia in good standing at their College or University Home Library are eligible to use GIL Express. Retired faculty and staff should check with their Home Library to determine if they are eligible to use this service. Can everything in the GIL-Find Catalog be borrowed through GIL Express? No. Only books from the general collections of the libraries at each of the 26 University System of Georgia member institutions are available through GIL Express..
Can I use GIL Express from my home computer? Yes, if you have an internet connection and are an authorized user. Log in to your university library’s GIL-Find catalog to make a GIL Express request..
What are the borrowing privileges for GIL Express? Everyone has a 28-day loan period with 2 renewals (if no one else has requested the book). If you need the book for longer than this you will need to return the book and request it again. There are currently no overdue fines but some libraries charge overdue recall fines..
Once a GIL Express book becomes overdue, your borrowing privileges are blocked by your own Home Library. You will not be able to check out GIL Express books until the overdue book has been returned. 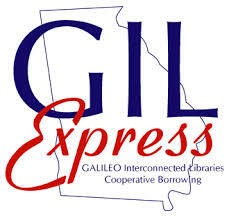 See your Home Library for complete information on GIL Express borrowing procedures. How many books can I borrow through GIL Express? The total number of books that may be borrowed through GIL Express is 100. Does that mean that I can borrow 100 books from each library? No. The total number of books that you can have charged to your library account from all USG libraries through GIL Express is 100. Each library can set its own limit for the number of books that you can borrow from that library through GIL Express. This limit is typically based on the size of the collection and the needs of the library's primary patrons. I'm a student at the University of North Georgia and am also employed at Georgia Gwinnett College. Where is my Home Library? What borrowing privileges do I have? Technically, either library can be your Home Library. However, for ease in tracking your GIL Express material and your obligations, you are strongly encouraged to select one library as your Home Library and stay with that library. If you move back and forth you will lose the ability to see a consolidated list of everything that you have checked out, as well as other obligations, through GIL Express. You should also remember that GIL Express has standardized policies. For materials that are not checked out through GIL Express, individual library policies (including borrowing privileges) may differ. Do I have to have my school ID with me to check out a GIL Express book? No. A picture ID card is required to use GIL Express at any USG library. While the preferred form of identification is a current, valid picture ID card that is issued by your Home institution you may also use a government-issued current, valid picture ID such as a driver's license or a Georgia ID card, a US passport or a US military ID. How many times can I renew a GIL Express book? Gil Express books are renewed automatically. You will receive an email notice shortly before the final due date. You can return GIL Express books to any USG library. Wherever you return the books, the library staff at that library will discharge the books and return them to their respective owning libraries. If a book is checked out, you can place a recall on it through your Home Library’s GIL-Find catalog. This will shorten the due date and, when it is returned, the book will be held for you. Each library can decide if it wants to charge recall fines. However, if recall fines are charged to GIL Express patrons, the fine is $2.50 a day for every day the book is late. Individual libraries have different policies about recalling materials. Please contact the Circulation/Access Services Department of the library that owns the book for more information. Am I still responsible fro returning my books on time, even if I don't get any notices? Yes, it is the responsibility of the patron to return books when they are due. All of the books you have checked out and the books that you've requested, as well as fines/fees and blocks, can be viewed online by logging into your "My Account" record through your Home Library’s GIL-Find catalog. This allows you to monitor all of your obligations to all USG Libraries at any time. Will I be charged overdue fines for returning a GIL Express book late? Currently fines are not charged for overdue GIL Express books. If your GIL Express book is overdue, your account will be blocked at your Home library. This will keep you from requesting books and will prevent books on your account from automatically renewing. The block will remain until the overdue book is returned. My library uses a set price for a book if one is lost. Does every library use that method? The library owning the borrowed item will send a courtesy notice to the address shown on your account to remind you the book is due. If the item remains overdue, the lending library will send you a courtesy bill; your home library may notify you as well. Non-receipt of a notice or bill does not relieve you of any outstanding obligations. Can I buy a replacement copy instead of paying for a book that I lost? Some libraries in the University System of Georgia may accept a replacement copy in lieu of payment for a lost book. This is at the discretion of the library that owns the book and you would have to make arrangements directly with that library. It is at the discretion of the library to charge the processing fee when accepting the replacement copy of the lost book. The processing fee for one lost GIL Express book is $35.00. This fee is set by a statewide policy and is based on the average cost to an individual library to process a replacement copy of a book that is already in its collection. The processing fee is non-refundable.